The week of July 18-22 was mighty kind to most of the sudsers on the daytime dial. I said most... (Source: Soap Opera Network) NBC’s Days of Our Lives was the only soap opera not to increase in total viewers over the previous week. In fact DAYS dropped 90,000 for a last place finish. DAYS was also last in households and came in fifth among women 18-49, tying its all-time low in that demo. Among women 18-34 however, DAYS held steady in second place. Storywise, the worst of Dena Higley’s many monstrously bad stories (and that’s saying something), The Saga of The Two Rafes, wrapped as Rafe 2.0 (Galen Gering) was killed in his cell. Elsewhere in Salem, U.S.A., The police stopped Stefano (Joe Mascolo) from fleeing town; EJ (James Scott) signed over his kids to Sami (Alison Sweeney) and Carly (Crystal Chappell) continued to be a crackhead. Despite glowing performances from Chappell and Melissa Reeves (Jennifer), this Carly The Pill Popper story is just as abysmal as the Two Rafes, because the implausible yarn came out of nowhere. I’ve said this before, but it begs repeating. It makes no sense that Carly Manning could survive being buried alive and not turn to prescription drugs, but a crush on Daniel (Shawn Christian) could turn her into Lindsay Lohan. Sorry, not buying it. If DAYS wants to see how to do a proper substance abuse storyline, they should click the channel to All My Children. That soap is doing amazing work showcasing JR’s (Jacob Young) nosedive off the wagon. As for DAYS, September really can’t come fast enough. Moving on to AMC, the Pine Valley-set sudser went up an insane 261,000 total viewers over the previous week. AMC also went up two-tenths of a point in households however, it didn’t budge among women 18-49, or women 18-34. That hacks me off. I am so over soaps&apos; fates being dictated by these ridiculous demos! Anytime a broadcast TV series gains almost a third of a million viewers over the previous week, it should be cause for celebration, no matter what age range or gender they fall into. Maybe Madison Avenue should stop trying to force soaps to get younger women to watch and instead work harder to sell to the people who actually are watching? In story, Erica (Susan Lucci) finally managed to get through to Jane (also Lucci), as Tad (Michael E. Knight) reminisced about Dixie (Cady McClain) and a drunk JR (Young) went ape poop over Binks (Christina Bennett Lind) stealing his old lady. In other words, for the first time in a long, long time, All My Children was a good soap opera gain. The show got even better the last week of the month (which of course doesn’t have anything to do with the ratings for July 18-22, but I can’t wait until next week to gush!). Erica, Tad, Opal (Jill Larson) all finally feel like the characters we know and love and not pod people, rendered devoid of personality by a string of terrible writers. Welcome home, Mama Agnes and Lorraine, welcome home. One Life to Live also saw a stellar increase among total viewers, climbing 202,000. OLTL was tied with its ABC sister soaps for third place in households and was tied with The Bold and the Beautiful for third among women 18-49, having inched up one-tenth of a point. OLTL also went up a tenth of a point among women 18-34, tying General Hospital and DAYS in second place. I know I sound like a broken record, but ABC needed to call the NYFD, because OLTL was on FIYA the week in question! From the Two Todds (Roger Howarth and Trevor St. John) facing off, to that adorable little Spidey Sam (Patrick Gibbons, Jr.) rescuing his Aunt Dorian (Robin Strasser) from the villainous Echo (Kim Zimmer), the show was campy, good fun. 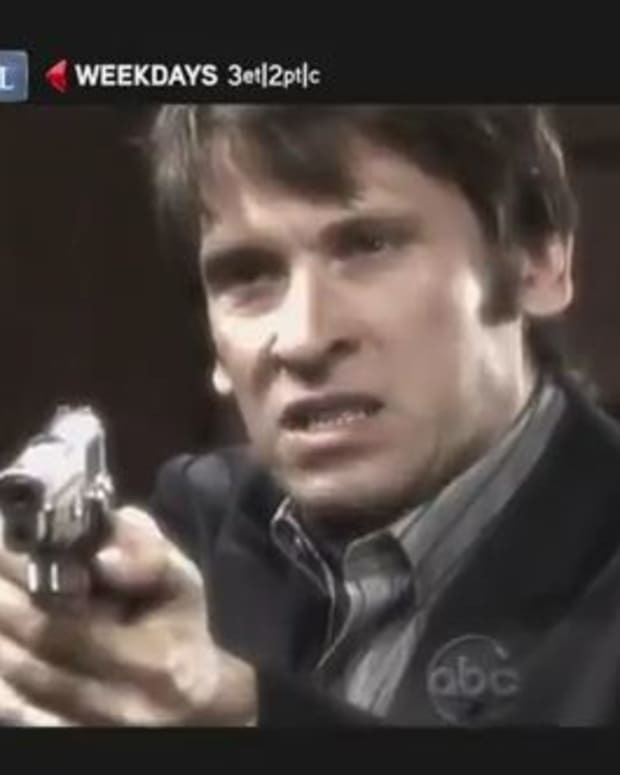 One thing you can always say about OLTL is there’s a method to the madness. As I was watching the episode where Echo kidnapped Dorian, I was on Twitter griping about how the plot point made absolutely no sense. Why would Echo go from water fighting with Dorian to kidnapping her?! However, the moment Sam burst through those doors and used his Spider Man web slingers to affix the dastardly Echo to the wall, I was howling with glee. Much like AMC, OLTL got even better the week that followed. The reveal of Nate (Lenny Platt) and the mercifully absent Deanna’s (Nafessa Williams) skin flick at the Vicker Man premiere was Santa Barbara worthy, but I’ll talk more about that in next week’s Ratings, Rants and Raves. As happy as I am about OLTL and AMC moving online, if ABC had the sense God gave a goat, they’d turn OLTL into a weekly, primetime soap spoof ala Ugly Betty, featuring Tuc Watkins and convince Nathan Fillion and Judith Light to recur. GH also had a good week ratings-wise, going up 180,000 total viewers. GH also went up one-tenth of a ratings point in households, women 18-49 and women 18-34. Storywise, GH was solid for the first time in weeks. For starters, I finally recognized my beloved Brenda Barrett (Vanessa Marcil Giovinazzo), just as she was heading out of town. The fire, pathos and passion showcased in Sonny (Maurice Benard) and Brenda’s five millionth break-up brought a tear (Okay, a waterfall) to this cynical soap blogger’s eye, as did Jax (Ingo Radamacher) saying goodbye to Joss and his stepsons. I can even admit I found a lot of the JaSam (Steve Burton as Jason and Kelly Monaco as Sam) proposal stuff comical and sweet. While I am Team Liason for Life, GH has been lacking romance of any sort for so long, that I could at least appreciate well-written romance scenes, no matter which couple they were written for. Perhaps with Brian Frons busy trying to launch The Chew and The Revolution successfully—and in effect save his arse— maybe, just maybeGarin Wolf will be permitted to explore the JaSam vs. Liason triangle again? The CBS sudsers did impressive business the week of July 18-22. The Young and the Restless went up 195,000 total viewers and inched up one-tenth of a point in households and among women 18-34. Y&R went up two-tenths of a point in the coveted women 18-49 demo. In spite of the Perils of Sharon Newman (Sharon Case), I enjoyed Y&R the week in question. The Jabot launch was glam, glitzy and recalled Y&R stories old, like the premiere of the Jabot Men’s Line way back when that hot mess Brenda Dickson was playing Jill in the 80’s. As much as it annoys me that Katherine Chancellor (Jeanne Cooper), who basically spent the 80’s drunk at The Colonade Room, is now some sort of octogenerian corporate shark, the power struggle for McCall and therefore Jabot is one of Y&R’s best bets right now. I also can’t get enough of that scheming, well-preserved minx Diane Jenkins (Maura West). It boggles the mind that Maria Arena Bell doesn’t realize what she has in this uber popular, Daytime Emmy-winning mega star. B&B went up 82,000 total viewers over the previous week. B&B was No. 2 in households and went up a tenth of a point among women 18-49 and among women 18-34. The week of July 18-22 belonged to Hunter Tylo on B&B. Taylor Hayes, M.D. did WORK in Los Angeles that week! That mad, mama lioness was racing up and down the Pacific Coast Highway hoe-checking folks about her kids and I loved it. Ridge (Ron Moss), Stephanie (Susan Flannery) and that Nasty, old Dollar Bill (Don Diamont) all felt the wrath of Doc Hayes as she prevented Thomas (Adam Gregory) from signing over his Forrester shares to Ridge and told Bill to keep his filthy paws off Steffy’s (Jacqueline MacInnes Wood) silky drawers. Is it me, or is Brad Bell the only showrunner in daytime, whose story teases in magazines actually live up to what we end up seeing on our screens? I can’t wait to see the remainder of the Battle of the Forresters play out, hopefully for many years to come. See you next Ratings! For the full ratings for the week of July 18-22 visit Soap Opera Network!